Continuing our look at the Chilton Ranch in Arizona, and what the Chiltons are doing for wildlife. Even after the ups and downs at the hands of wildlife agencies and advocates that Jim Chilton has gone through, he still dug in and studied the next endangered species listing with huge potential to affect his livelihood: the Chiricahua Leopard Frog. “I came to believe that that listing was valid,” he tells me. “The frogs were in desperate condition, verging on extinction. So I decided I would try to do something for the frog. I worked with the U.S. Fish & Wildlife Service and Arizona Department of Game & Fish, where my wife has also served as Commissioner. 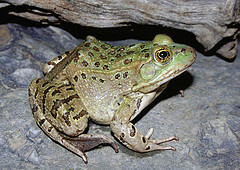 “I had 21,200 acres surveyed, but we found no Chiricahua Leopard Frogs. So I entered into a Safe Harbor agreement with Arizona Game and Fish and the US Fish & Wildlife Service. In 2009, Jim built - at his own expense - a $7000 refugium for the frogs on his property. “It’s simply a big hole about 60 feet long and 25 fee t wide, with a graded water depth of a few inches to 5 feet deep. I had a swimming pool company line it with a special concrete to ensure no cracking and leaking. I built a water line to the refugium, and a float valve ensures the water always stays at the same level. That was two years ago, and the frogs seem to be doing well. Jim hopes to someday take the frogs and start establishing them in his stock ponds on private land and state school trust lands. One of the major limiting factors on the frogs is predation by bullfrogs. Jim says that about 70 years ago the Arizona Game & Fish Department thought, ‘wouldn’t it be nice for hunters and fishermen to be able to hunt Midwest bullfrogs,’ so they planted them in riparian areas. Over time they’ve wreaked havoc on native frog populations. Next up: in the battle between this rancher and an advocacy group, who wears the white hat?